In the summer of 2010 a hairy invasion began. 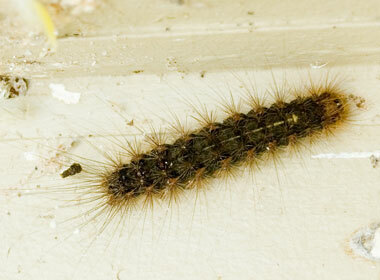 First it was novel, one or two hairy caterpillars crawling through the aviary service area, or falling off the door frame whenever the sliding door was opened. 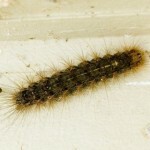 As summer progressed the numbers of these hairy brown caterpillars increased dramatically until they were everywhere – up the walls, along the skirting boards, in the door frame and in the curtain folds. 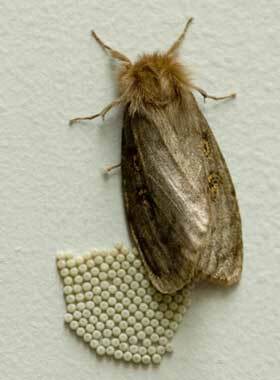 Then they started to pupate, turn into moths … and lay eggs. 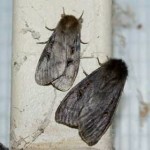 By this time we had enough information and specimens to identify the invaders and they were positively id as White Cedar Moths, Leptocneria reducta. We have a number of young White Cedar trees planted to provide summer shade to the aviaries so another piece of the puzzle fell into place. 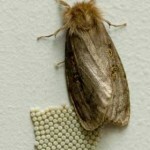 The moths were almost as numerous as the caterpillars, and before long there were clusters of eggs on the service-way walls and dead moths all over the floor and trapped between the polycarbonate and aviary mesh. 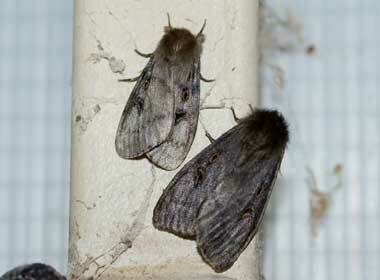 The moths themselves are nothing spectacular, in fact almost drab. Their egg clusters are intriguing and conveniently some were in plain enough view that we were able to observe and record their progression to hatching. 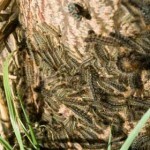 The caterpillars emerged en-mass, hung around for the day, and by the next morning had all disappeared. There was no sign of them or their egg cases. 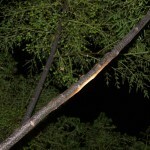 It is possible some may have survived to reach the White Cedar trees as there were no suitable food plants any closer. Or they may have fallen prey to a hungry spider or centipede. 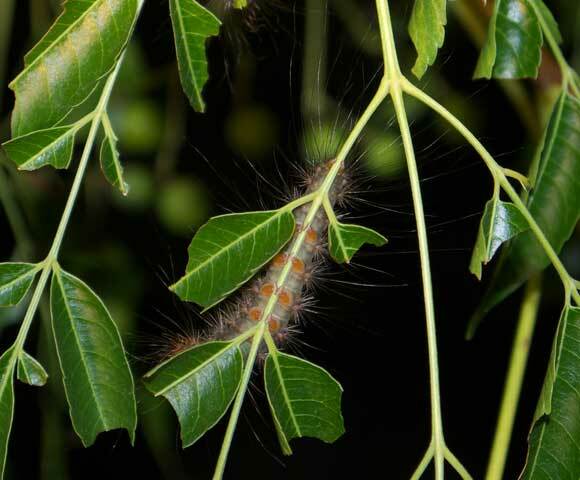 No further sign of juvenile caterpillars was seen inside the aviary service area or bird-room. 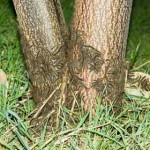 During autumn however, the White Cedar trees acquired woolly, hairy “trunk-warmers”. 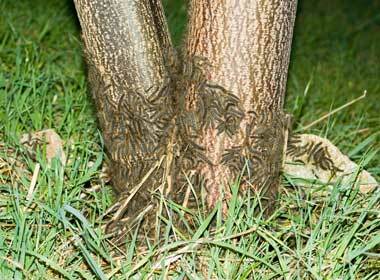 Masses of White Cedar Moth caterpillars congregated at the base of the tree trunks. Presumably under the cover of darkness they venture up the trees to wreck havoc on the leaves. While some damage is evident, it does not seem to concern the trees, which are deciduous, and have just about lost all their leaves by June. 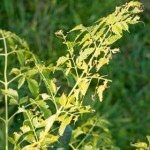 White Cedar Moth caterpillar damage to White Cedar leaves. 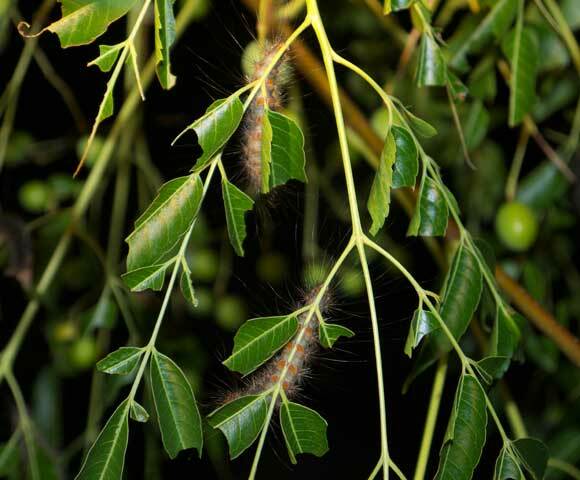 The mass of caterpillars, armed with spiky and irritating hairs, would pose an unpleasant barrier for anything else small wanting to climb the tree or gnaw on it’s lower bark. Perhaps this behaviour is their way of protecting their food supply – the trees and their leaves – from other potential competitors or threats. 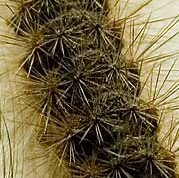 White Cedar Moth caterpillar close up of spiky hairs. 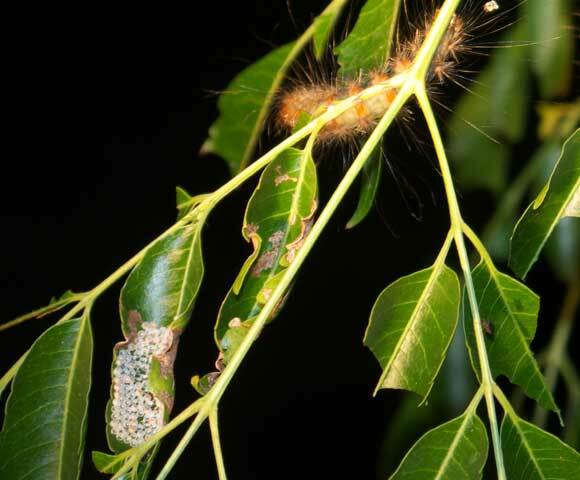 White Cedar Moths belong to the Leptocneria family, and both the moths and caterpillars are yet another in the “handle with care” category. 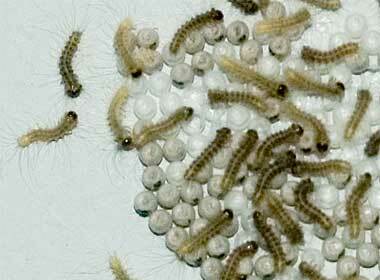 Their hairs are irritants and will shed easily. 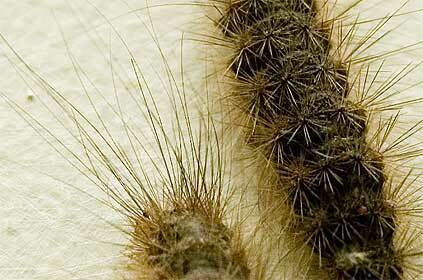 The caterpillars might look cute and furry – but they are definitely not! Do not let children play with them. 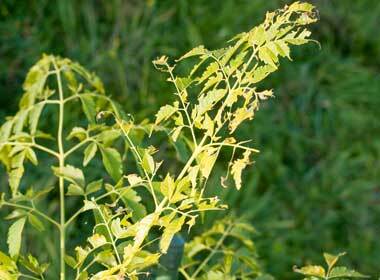 The hairs can not only cause skin irritations in humans, they have also been implicated in abortions in horses. 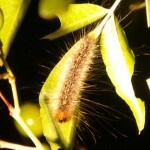 The caterpillars, pupae, and moths are all sources of irritating hairs, which retain their irritant properties long after they have been shed. 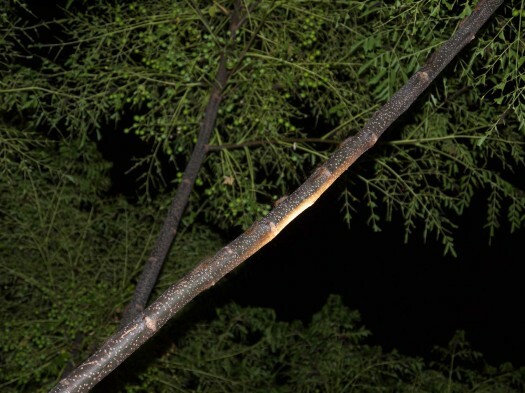 Caterpillars streaming up the branches. 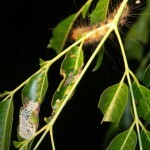 Adult caterpillars and egg clusters on a lower leaf. 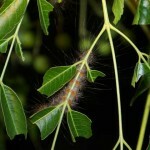 Half grown Cedar Moth caterpillar. Which is indeed what they are doing. 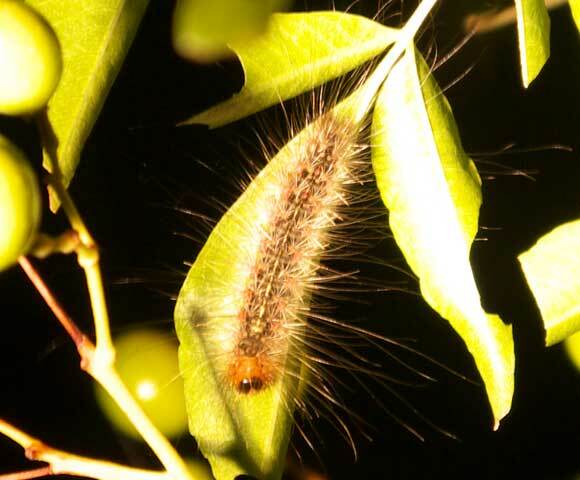 An evening torchlight visit to the White Cedars revealed them to be literally crawling with big, fat, White Cedar Moth caterpillars. They were streaming up the branches in lines, shunning away from the light from the torch (click for large photo which will open in another window/tab). 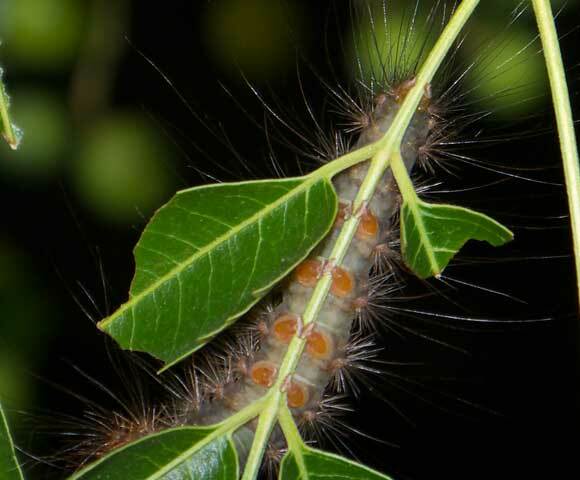 The underside of the leaves (or what’s left of them) were bristling with hungry, hairy catterpillars. 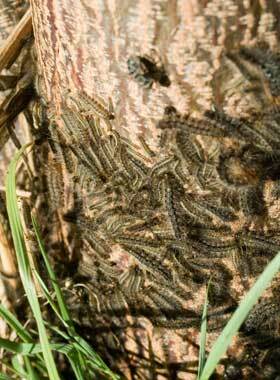 White Cedar full of Cedar Moth caterpillars. 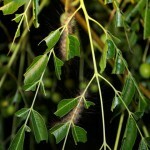 Caterpiilars hug the underside of the leaves. 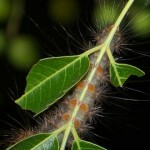 Close up of the Cedar Moth caterpillar's grip. The trees themselves seem to be responding with new emergent growth at the tips. It will be interesting to see if this new growth is as tasty, or whether the trees are able to defend themselves and become less palatable as some other plants can. 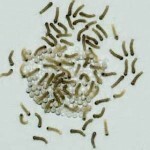 The absence of caterpillars during the day this year may indicate they prefer dry grass and leaf litter, and disliked the lush grass and damp ground experienced in previous years. This has implications for potential organic control of them should they become a problem that the trees cannot cope with by themselves.